Note: You can also use sugar instead of jaggery but it will not give the same taste. Dry roast split mung beans until it turns golden brown. Pressure cook the rice, split mung beans & water for 3 whistles. Let it cool before opening the lid. In a pan add water & Jaggery. Let jaggery melt & when it starts boiling. Add cooked rice & split mung beans, mix well. Keep stirring in between to avoid sticking to bottom. Cook till water evaporates & it reaches semi liquid state. Note: Add more jaggery if you need more sweet. Heat the ghee in a tempering pan. Add Cashew nuts fry till it gets slightly light brown on the edges. Add raisins fry till pops up like a balloon & changes color slightly. Pour this on the top of the rice, stir well. Sweet pongal/Sihi pongal is ready. Serve hot with ghee on top of it. Delicious post. Try submitting your blog posts to www.indli.com for more viewers. 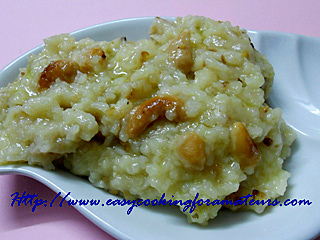 Sweet pongal looks awesome delicious. pongal looks awesome!...yummy and delish! That chakarai pongal looks really gooey and delicious! First time in your blog. Pongal looks yum. First time here..u hv a wonderful space..visit mine as time permits..